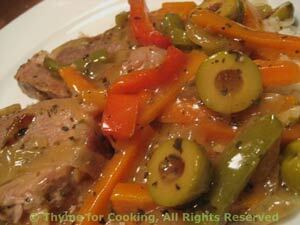 Spanish Pork Tenderloin, with peppers and olives, easy dinner recipes. More from Spain: In traditional Spanish cooking the emphasis is on the combination of vegetables, some of which may seem strange but it's simply using what is available. This is a simple dish that works with anything. I used spinach spaghetti. Add minced garlic, herbs, and sauté for a few minutes. 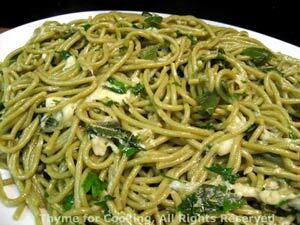 Add drained pasta, toss quickly, remove from heat and add Parmesan. Return vegetable to skillet, add olives, etc.